If you're waiting for a punchline to this cliffhanger title, this isn't a joke -- it's a real-life solution to your constant quest for the ultimate low-cost, compact workout tool that you can take anywhere. I'm sorry, did I say "constant quest"? I meant it's the solution to all your whines about fitness costing too much. Because if you can spare $30 and about 30 minutes a day, you can get in killer shape with nothing more than a simple suspension trainer. Suspension training already gets two quick points for providing a low-cost, portable workout, but the benefits don't end there. 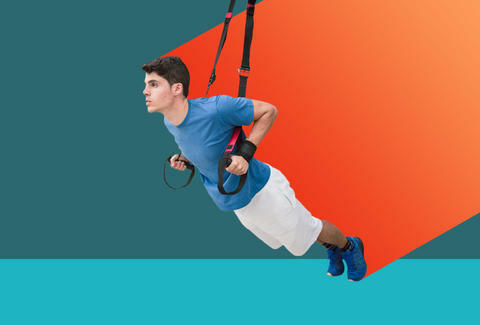 Jamie Costello, fitness director at Pritikin Longevity Center + Spa, explains, "Suspension training is unique because it utilizes the exerciser's bodyweight for all of the movements." Since you're using your own bodyweight as resistance, the equipment itself can be very lightweight -- hence the portability. Costello also points out that the very nature of performing exercises while suspended (in one manner or another) from straps means that it provides a means for improving balance and stability -- skill-based components of fitness -- in addition to training muscular strength and endurance. Workout design can also be very flexible and inclusive. "You can adjust exercises from challenging to easy with simple form modifications, and you can move quickly from exercise to exercise in a continuous circuit to incorporate aerobic conditioning," says Costello. For these reasons, suspension training can be just as effective for beginners as it can be for athletes. It's one thing to understand the benefits of suspension training, but it's an entirely different thing to experience a workout firsthand. Thanks to Costello, we've got the perfect beginner-friendly workout for you. Perform three to four circuits, rotating between exercises without rest, as described. For this one, you're going to combine a squat-to-reverse fly with a squat-and-row. Stand facing the suspension straps, your feet roughly shoulder-width apart, your knees slightly bent. Grasp the handles with both hands in front of your body, take a deep breath, then perform a deep squat, pressing your hips back as you bend your knees and lower your glutes toward the floor. When you reverse the movement to return to standing, engage your back and pull your hands toward your body to perform a row as you stand. As you get closer to the full standing position, pull your hands apart and lift them to a "Y" position with your arms, keeping tension in the straps throughout. This exercise is like the two-legged version, but with one leg crossed over the other. Grasp the suspension strap handles at roughly chest height, with your arms extended in front of your body. Engage your core and lean forward, pressing the handles away from you until you're in a modified push-up position. Pick one foot up off the floor and cross it over your opposite heel so you're balanced on one leg. Keeping your core engaged and your hands fixed in front of your chest (working to keep the handles stabilized), bend your elbows, lowering your chest between your hands. When you've performed the downward phase of the push-up, reverse the movement and press back to the starting position. Perform 10 push-ups before switching legs and performing 10 more. Suspension mountain climbers offer a quick burst of cardio and are very similar in form to traditional mountain climbers, but with your feet suspended in the straps, you'll further engage your core. Adjust the straps so the loops are relatively close to the floor. Kneel on the ground in front of the suspension trainer and slide your feet into the loops -- one foot per loop. Place your palms on the ground directly under your shoulders, engage your core, lift your knees from the floor, and extend your legs so you're in a full push-up position with your feet suspended. Once you're steady, perform the mountain climber by pulling one knee to your chest with your other leg extended, then switch legs, extending your bent knee and drawing your straight leg to your chest. Continue alternating legs as long as you can while maintaining good form -- aim for 20 to 60 seconds. Lunge curls will work your lower and upper body in one fell swoop. Adjust the suspension straps so that the handles are positioned roughly at chest height when you hold the handles at your chest (elbows bent). Position yourself so the straps form a 45-degree angle from their fulcrum. From this position, lunge backward with your right leg, planting the ball of your foot on the ground. Keeping your torso upright and tall, bend both knees, lowering your back knee toward the ground. As you do so, allow your arms to fully extend. From the bottom of the lunge, press through your front heel to return to standing, as you do so, keep your upper arms fixed at shoulder height and bend your elbows, curling the suspension strap handles to your shoulders as you use your arms to help pull you to standing. Repeat on the opposite leg. Perform 10 total reps per leg. To perform the single-arm reach-back, stand with your feet shoulder-distance apart holding both handles in your left hand, your elbow bent at your side so the handles are at your left shoulder. The TRX strap should be at a 45-degree angle from its fulcrum. Extend your right arm so it's parallel to the straps. Engage your core and press your hips back to squat down, bending your knees as you lower your glutes toward the ground, straightening your left arm as you squat to hold tight to the handles. During this squat, keep your right arm straight and twist your torso to the right to reach back toward the ground, touching your right hand down behind you. Reverse the movement to return to standing, pressing through your heels as you twist your torso back to center. Perform 10 repetitions before repeating to the opposite side. Laura Williams is an exercise physiologist and fitness writer who just bought a suspension trainer so she could do this workout. Thirty dollars well-spent. Connect on Twitter @girlsgonesporty.